Planting tomatoes outdoors is still do-able even if you don't have much space. 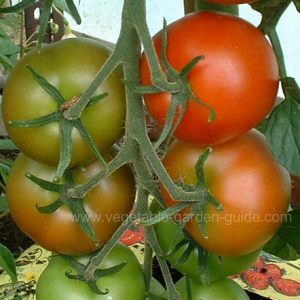 There is no reason at all to have to pass up an opportunity of growing tomatoes because you think you need lots of tomato growing room - you just don't. And whats more planting tomatoes outdoors tend to give more intense flavours. If where you live has only a patio, balcony, flatroof or similar you can grow tomatoes. Many parts of Britain though, will require protection for your tomato plants. This is to enable enough of the fruit to ripen - a greenhouse, or in cold frames or, if growing dwarf varieties - under cloches. But if you are fortunate enough to live in a mild area that is sheltered from cold winds then you can expect a satisfactory crop. Even better, if you have a south facing wall or fence for planting tomatoes against then expect a lot more of your tomato crop to ripen. I have known people make their own south facing 'wall' by stacking bales of straw - be creative. Read my instructions for planting tomatoes, but please... don't stop there - make sure you have a go. I have encouraged so many friends and aquaintances to try planting tomatoes that without exception those that do have a go are thrilled at their success. There are few things more satisfying than walking in your garden - or patio, balcony or flat roof... and eating a tomato straight off the plant to experience that taste bud exploding intensity of flavour - mmmmmm delicious. 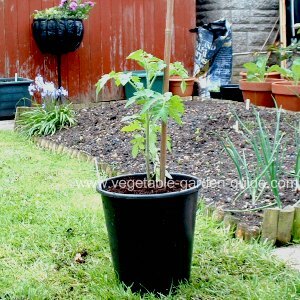 REMEMBER you can pop a plant or two into pots or growbags and place them anywhere in full sun and then erect some kind of support structure or grow the small bush tomato varieties. When planting tomatoes outdoors grow only those varieties that are recommended for outdoor cultivation - there are many varieties. 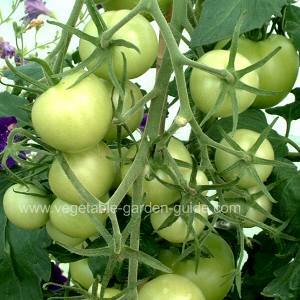 If you buy young tomato plants to grow-on be especially sure these are suitable. Planting tomatoes outdoors requires a humus-rich soil that drains well - a pH of 6.5-7.00... if you are interested. Do you have that south facing wall or fence we mentioned earlier? If so and it has a soil border then dig in plenty of well rotted compost or manure during the winter. A couple of weeks before planting tomatoes rake in a general fertiliser like Growmore. No border - no problem! Just follow my instructions for growing tomatoes in containers and growbags as described on the "Indoor Tomatoes" page (click on "Indoor Tomatoes" and a new page will open don't worry - this one will remain open). As mentioned above, growbags and containers can be placed in the garden, on a patio, balconies or even flat roofs... I'm sure you can think of more places, just look around. Planting tomatoes in this way will require a little more attention - but they are still worth the effort. If you require just a few plants then the easiest and cheapest option is to purchase healthy young plants from a nursery or garden centre - I have no problem recommending this approach as it dramatically reduces the odds of failure should you have little space or only a window sill to rear your seeds on. 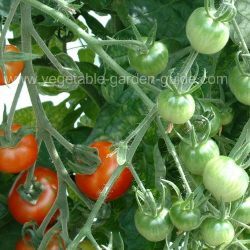 Look for tomato plants that are dark green, sturdy - not pale and lanky - and about 20cm(8") tall. Plant out when the flowers of the first truss are begining to open. Water the plant well just prior to transplanting. If planting into a border try spreading black polythene sheeting over the ground then planting tomatoes into the border through slits cut into the plastic sheeting - you should get a better crop. Heres a bit of trivia - see the photo to the left. The stem of this outdoor tomato plant was hanging horizontally to the soil. As you can see roots have started to emerge from its stem and are pointing to the ground. This action by the roots is called negative geotropism - a posh way of saying that roots are sensitive to the pull of the earths gravity. Yep... thats why roots generally grow downwards. Good ere - in'it. Support and tie stem to the support as the tomato plant grows. Pinch out side shoots when they are 2.5cm(1") long. Don't allow more than four trusses to develop. Pinch out the growing tip two leaves above the fourth truss. Water and feed regularly - see "Indoor Tomatoes"
Tomato Blight - really potato blight, as they are both from the same family. This is a disease that can devastate outdoor tomato plants, especailly in wet, humid conditions. Look out for brown areas on the edge of leaves. These patches spread until the leaves are killed. 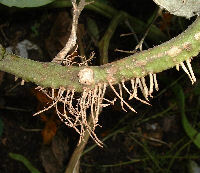 Blackened patches also appear on the stem of the tomato plants and the tubers below ground become infected too. Be even more on your guard if you also grow potatoes. There is no effective treatment once your tomato plants have become badly infected. Dig the plants up and burn them - do not leave any tubers (volunteers) in the ground as the disease will resurface next season. Prevent infection by routinely spraying with Mancozeb (Bio Dithane 945) every 14 days when the weather becomes damp and humid. This can be lengthened during prolonged dry spells. Were appropriate, at the end of the season remove the supporting canes and lay the stems down on a bed of straw, cover them with cloches to ripen more of the fruit. Planting tomatoes of the bush variety make growing outdoor tomatoes a lot easier - they don`t need supporting, stopping (pinching out the growing tip) or trimming... but you may need to get your shears out sometime just to keep a little control of their spread. 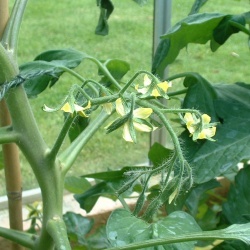 Bush tomatoes are also great for growing under cloches as some varieties are creeping plants less than 23cm(9") tall. The actual bush varieties themselves are only 30cm(1ft) to 75cm(2.5ft) tall. Harvesting is slightly more awkward as the fruits tend to be hidden unlike the cordon grown way. Make sure you lay straw or plastic sheeting around the plants as some fruit will be at ground ground level.